Here at The Male Stylist we don’t usually devote a whole article to a single item but then something quite extraordinary comes across our desk and, suddenly everything changes. Today, The Man About Time reviews a very special watch, for which it is certainly worth rewriting the rules. Recently we looked at iconic chronographs and it is possible to argue, with a lot of recorded watch history on your side, that all chronographs owe a spiritual debt to Louis Moinet. Chronographs, literally ‘writing time’ are about showing and recording elapsed time rather than displaying the time of day. A little over 200 years ago, and before the word chronograph was coined, Louis Moinet began work on what would become the world’s first chronograph, his ‘Compteur de Tierces’. Today watches with chronograph functions are to be found in every jeweller’s window but finding something out of the ordinary, which combines a sense of heritage, craftsmanship and technology with a truly individual style, takes a little more discernment. However, if you have the necessary means, then the independent watch company which bears Louis Moinet’s name has produced a true classic with the introduction of the Memoris to its range. Designed and crafted to celebrate both the 200 years since the Compteur de Tierces and the ten years since the revitalising of the brand the Memoris was introduced at this year’s Basel Watch show, since when it has been gathering great reviews for its technical excellence and stunning appearance. Memoris is not simply another fine watch with a chronograph complication added, it is a return to the heritage of Louis Moinet himself with the core movement being the chronograph and the complication displaying the time. We could go on at length (and many writers have) enthusing about the horological significance of this limited edition watch and its unique ‘Energie plus’ winding mechanism but we are going to let that rest and look at its style. At 46mm diameter it is a significantly sized watch though its elegant lines mean that it wears handsomely on all but the smallest of male wrists. 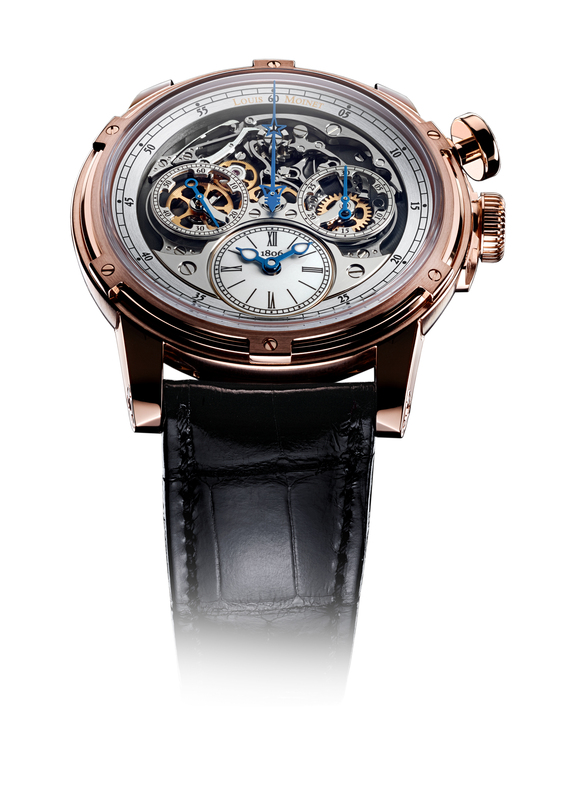 It is available in three finishes, rose gold, white gold with a rhodium mainplate or white gold with a blued mainplate. Given its inspiration, we should not be surprised that the crisply executed but beautiful figured movement on display is that of the chronograph rather than the time display, though that itself is exquisite. We make no apology for our enthusiasm for the Memoris; it isn’t for everyone, but with only 60 pieces of each finish available it was never going to be. The Memoris is an extraordinary watch for individuals whose appreciation for the very best of modern design and technology remains rooted in their sense of history. Furthermore, it has been nominated for the prestigious Grand Prix d’Horlogerie of Geneva, reinforcing its credentials as a classic timepiece. 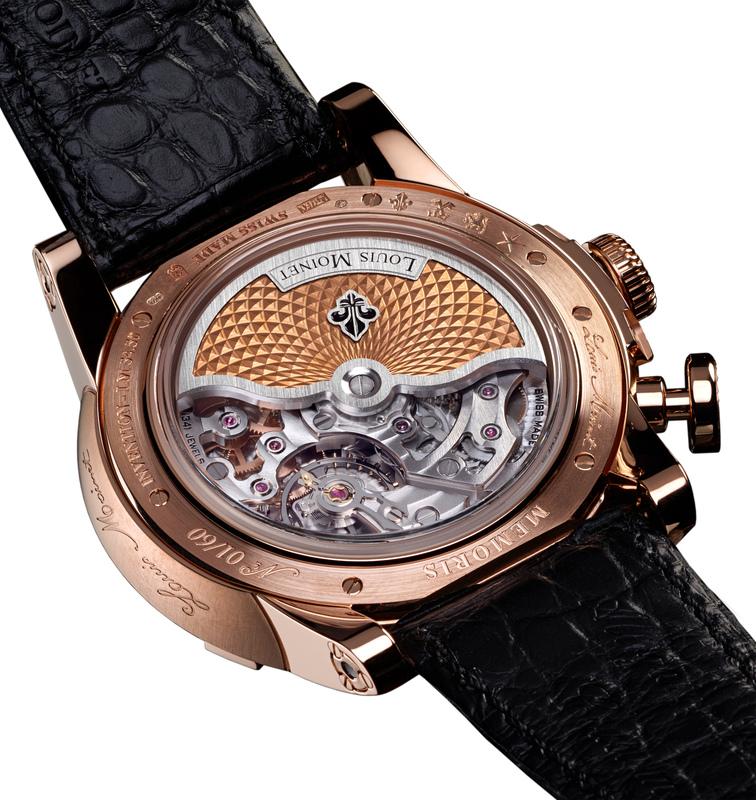 However it isn’t the only amazing timpiece that Louis Moinet offer and a visit to their website reveals a range which delivers the highest standards of watchmaking with an ethos that embodies both the companies exliving lineage and its drive to the future. However, as if looking at some of the most important timepieces in the world is not sufficient reason on its own to visit, the website also features some of the best product and information videos we have seen as well as an impressive list of some of the brand’s customers through its two centuries. Napoleon had a Louis Moinet clock as did Thomas Jefferson and Alexandre Dumas was moved to write about him at his death so if you can acquire one of his masterpieces then you can truly claim to have timeless male style! Disclosure: I partnered with the brand to write this article but every word is mine.